Will Iran Play the Crimea Card in Iraq? 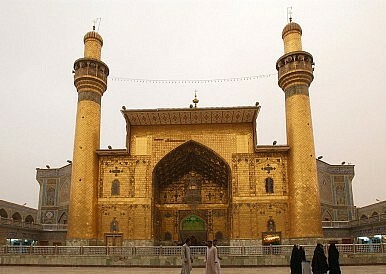 Not unlike Russia in Ukraine, Iran says it will intervene in Iraq to protect the country’s Shia people and holy sites. No country, with the exception of Iraq, is more threatened by the renewed sectarian fighting in Iraq. Iran has already vowed to defend the Shia government in Iraq, but thus far has stopped short of overt military intervention. Sensing an opportunity, and with Iran no doubt in mind, Gulf states like Kuwait and Saudi Arabia have warned against any foreign powers intervening in Iraq. Nonetheless, reports suggest that the Sunni militants are now reaching Baghdad. As I’ve noted elsewhere, it is extremely unlikely that they will try to take the city. Their recent successes in northern Iraq were achieved by classic guerilla tactics, such as ambushes on isolated Iraqi units. This inexplicitly led Iraqi troops to abandon their posts. The ISIS militants were able to “seize” major cities simply because they had been abandoned, as well as because ISIS had the acquiescence if not outright support of the Sunni populations. The Iraqi government troops and Shia militias will never abandon Baghdad, nor will the Shia parts of the city accept ISIS control without fierce resistance that small bands of ISIS militants would be incapable of suppressing. However, should events take an unexpected turn for the worse in Baghdad, Iran would be forced to intervene, at first with more covert help but eventually with overt military force. Because of geography, Iran’s border with Iraq is the part of the country where power is most easily projected. That presents an opportunity for Iran when it is strong, but also a major vulnerability when it is weak. This fact of geography has been reinforced to Iranian policymakers time and again, most recently when Saddam Hussein invaded Iran in 1980, sparking an eight year brutal war that claimed at least 1 million casualties and possibly many more. The Iran-Iraq War’s place in Iran’s collective memory is roughly comparable to how WWII is viewed in Russia and the century of humiliation is seen in China. Having anti-Shia fanatics seize power in Iraq would first and foremost be a major security threat to Iran. But it would also be a tremendous blow to the legitimacy of the Islamic Republic government itself. As such, the Iranian government will never allow ISIS to conquer Iraq and will undoubtedly intervene militarily long before this happened. Still, Iran has always tried to defend its foreign policy as just to the international community. While all nations do this to an extent, Iran is particularly obsessed with justice (as it defines it) due to the peculiar nature of its revolutionary regime, and also because its limited military capabilities means that soft power is one of the primary ways it projects influence in the Middle East. In other words, Iran is playing the Crimea card in Iraq. Although Rouhani framed the issue as protecting Shia holy shrines, it is a small step from here to justify intervening in order to protect Iraq’s Shia population. Should Iran make good on this threat, and intervene overtly to protect Iraq’s Shia and their holy sites, the U.S. would face a conundrum. On the one hand, it has a clear short-term interest in seeing Iran shore up the Iraqi government and defeat ISIS militants. On the other hand, America has adamantly opposed Russia’s intervention in Crimea and eastern Ukraine—which was done on the premise of protecting ethnic Russians—and does not want to see Putin’s precedent further reinforced in the Middle East. This last part is important as the precedent has importance far beyond Ukraine and Iraq. Indeed, states justifying military interventions on the need to protect their ethnic and religious kin abroad have a long and inglorious past in modern history. After all, this was the pretense Adolph Hitler used to justify some of the Nazis early conquests in places like the Rhineland and Poland. There are also a number of possible contemporary opportunities to use the precedent. For example, many Southeast Asian countries have a history of violent outbursts against their ethnic Chinese populations. Should similar incidents happen in the future, China could intervene on the grounds of protecting overseas Chinese, even if these overseas Chinese themselves opposed Beijing’s intervention. As seen during Sri Lanka’s civil war, India could use a “responsibility to protect” doctrine to intervene in countries in South Asia. The Middle East itself is ripe for future Crimeas. For example, once it had played the Crimea card in Iraq, one could imagine Tehran threatening to intervene in countries like Bahrain or Saudi Arabia should sectarian uprisings by Shiites in those countries be met by violent oppression from the Sunni governments. Don’t just blame the U.S. China helped support the Islamic State of Iraq and al-Sham’s rise as well.